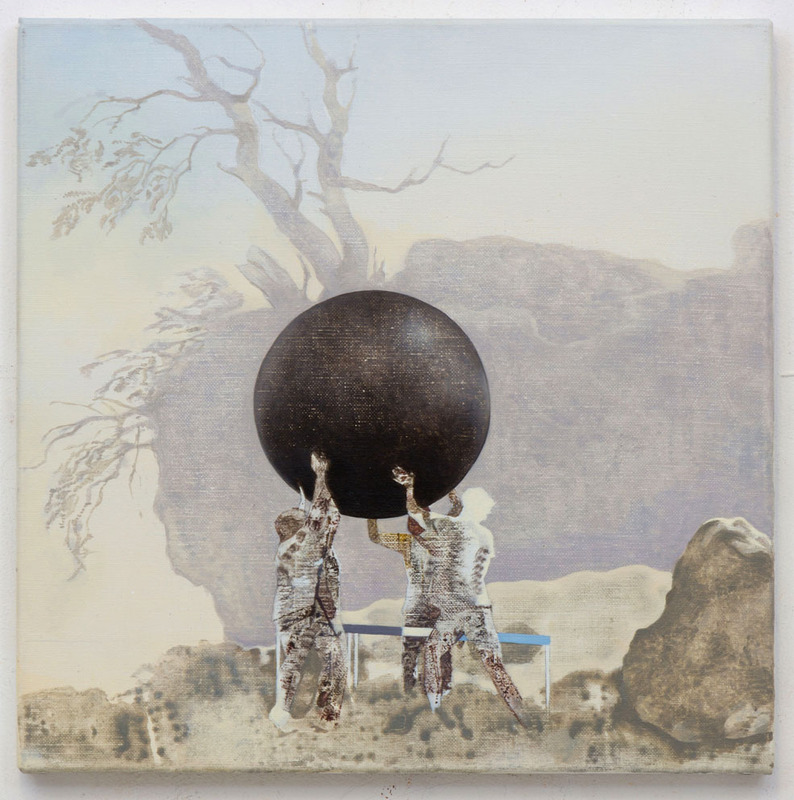 Killing Me Softly presents an assembly of various works in which hermit landscape paintings from art history form an unlikely backdrop for a course of team building activities. Sourced from the familiar as well as the obscure, Willems reworks the image of ascetic isolation counter-intuitively, for the bonding call of a bout of tower building or a game of paintball. Propped up and weathered like a trophy exposed to the elements, Postcard from a Corporate Fun day in a Hermit Painting by Salvator Rosa (2015), leaves the anonymous quiet of Rosa’s landscape an abandoned retreat, where the monks have fled and only the splatters of an ambush remain. When not in hiding, the workers in these paintings appear oblivious to their locality, whilst fading from view; and it is not clear whether they are emerging or evaporating from where they find themselves. Dislocated and remote, activity here appears Sisyphean; echoing the monastic solitude of the backdrops that the artist draws upon. Inspired in its title by the 1973 Roberta Flack song and album of the same name, Killing Me Softly is reconfigured as a critique; satirising the image of leisure within a Post-Fordist economy of ‘work’ that does not appear to be work. Simon Willems is a London-based artist and PhD researcher in fine art at the University of Reading (UK). Having graduated from the Painting School at the Royal College of Art in 2000, he has shown widely in both solo and group exhibitions throughout Europe, North America and Asia. These have included solo exhibitions at Torrance Art Museum (Los Angeles), FRAC Auvergne (Clermont-Ferrand, France), Galerie Polaris (Paris), Xero, Kline & Coma (London), Elaine Levy Project (Brussels), Percymiller Gallery (London), Wallspace (New York) and Mark Moore Gallery (Los Angeles). Willems work has featured in numerous group exhibitions including shows at: 176 Project Space - Zabludowicz Collection (London), Lion & Lamb Gallery (London), FRAC Haute-Normandie (France), FRAC Auvergne (France), Artothèque de Caen (France), Galerie Forde Espace Contemporain (Geneva), RAID Projects (Los Angeles), Vegas Gallery (London) and Galleri SE (Bergen), amongst others. His work has featured and been reviewed in Flashart, Art Review, Elephant Magazine, ART US, Le Monde, WOUND, El Pais, LaLibre Belgique and Beautiful Decay and was included in the survey painting publication ‘A Brush with the Real – Figurative Painting Today’ (Laurence King Publishing). In 2015 Willems completed a doctoral study trip to the Moderna Museet in Stockholm, which was sponsored by the Swedish Embassy in London. Willems work is included in several public collections including the Walker Art Center (Minneapolis), Bronx Museum of the Arts (NY), FRAC Auvergne, FRAC Haute-Normandie, National Museum of Gdansk and the Zabludowicz Collection (London).